Click here to download a FREE Business Credit Application and Personal Guarantee document as a pdf. If you sell products or services to other businesses, especially large businesses, you will often be asked to extend credit terms to them. What this means is you will supply them with your goods without them having to pay you any money upfront (or very little), and then they can wait anywhere from 30 to 180 days (depending on the terms you negotiate with them) AFTER they have received your goods before they have to pay your invoice. Buying on credit is normal practice for how midsize and large companies buy products or services from their vendors. Large companies will often try to extend payment terms to 180 days or longer so they can keep their cash as long as possible. Extending credit terms to a new business client can put your company at a financial risk because you are using your company’s resources to supply a business with your products or services without receiving payment for those goods for up to 6-months. Depending on how big the purchase order is from your client, it may cost you thousands, hundreds of thousands, or even millions of dollars to fulfill your client’s purchase order, and then you may have to wait from 30 – 180 before you will receive any payment from that client. The financial risk you face is what will you do if that new client who just placed a large purchase order with you decides not to pay you when your invoice becomes due? One of the best ways to handle this risk when dealing with a new client is to only extend them credit if they complete your Credit Application including a Personal Guarantee, and you approve them. 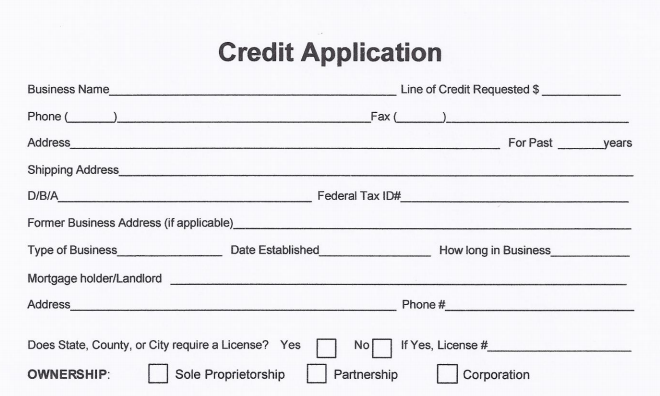 A credit application is a document where a company lists their business information, their banking information, credit references, and personal information on the Principals who own the company. You can then follow up with their bank(s) and their credit references to see if they pay their vendors on time. Having a completed Credit Application also makes it much easier for a commercial collection agency like Melton Norcross & Associates to go after your client and collect the money that is owed to you in the event your client decides not to pay you. Combined with a Credit Application is a Personal Guarantee legal document where a Principal at the company personally guarantees to pay your invoice in the event their company has financial problems and cannot pay you. If you are a client of Melton Norcross & Associates Collection Agency, you can find out if the client you are considering doing business with has any collection claims against them by calling 1-866-323-7043.